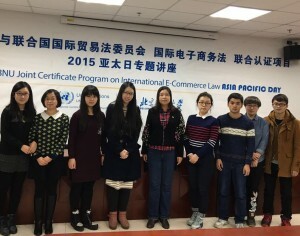 Under the umbrella of UNCITRAL-BNU Joint Certificate Program on International E-Commerce Law (JCP), BNU IIPL organized the Public Lecture on “International Trade Law in E-Commerce Environment” to celebrate 2015 UNCITRAL Asia Pacific Day on December 1, 2015. The United Nations Commission on International Trade Law (UNCITRAL) was established by the United Nations General Assembly Resolution 2205 (XXI) of 17 December 1966, recognizing that disparities in national laws governing international trade created obstacles to the ow of trade, and it regarded the Commission as the vehicle by which the United Nations could play a more active role in reducing or removing these obstacles. In 2014, the first regional centre of UNCITRAL, UNCITRAL-RCAP, established the UNCITRAL Asia Pacic Day to celebrate this historical resolution annually. In 2015, seven reputable universities across the region joined the celebration and it will continue to evolve in the years ahead. 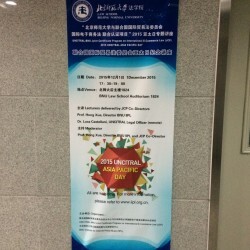 Please see the Poster-UNCITRAL Asia Pacific Day_final. AP Day Lecture will be delivered by two JCP Co-Directors, Prof. Hong Xue (BNU Institute for Internet Policy and Law Director) and Dr. Luca Castellani (UNCITRAL Legal Officer). Prof. Xue gave a briefing on the progressive development of JCP and out-looked its potential on teaching, research and international collaboration. Prof. Xue circulated the updated new flyer of JCP to the audience. Dr. Castellani joined remotely from Vienna and presented the lecture titled “The Future of E-Commerce Law: UNCITRAL Prospective”. Although the same presentation has been made in Beijing at different occasions several times, Dr. Castellani was always able to provide the updated and fresh knowledge and thinking to inspire future academic exploration. 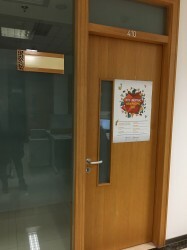 Many BNU students joined the lecture and actively participated in the discussions with the lecturers, despite Beijing’s terrible smoggy weather all through early December 2015. The students’ passion for JCP inspired all the faculties to work harder for the bigger achievements of the Program.